The short bull run or Encierrillo takes places every day during the San Fermin fiestas, at about 10.30 pm, although there is no set time and neither is the event announced in the official fiestas program, to avoid mass participation. Almost at nightfall, in complete silence and with few spectators, the bulls that will take part in the bull running and fight on the following day, run the 450 metres from the general bull enclosures known as the "Corrales del Gas" to the pen in the street of Santo Domingo. There, at 8 am on the following day, the bulls will start out on what will be their last run. 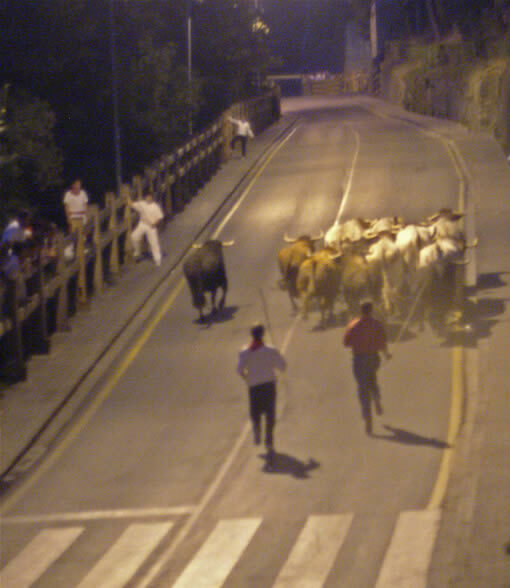 During the Encierrillo, runners are prohibited and the bulls run alongside the steers and herdsmen, crossing a bridge over the river Arga and running up a steep slope to the former city ramparts of Pamplona. Once the morning bull running has ended, each day, on the decision of the Head of the Municipal Police, four or five fighting cows are released into the bullring for the enjoyment of those present. There are some 1000 persons in the ring who entice the animals and try and dodge them as best they can. The charges made by the cows which, on occasions, have seriously wounded the people present in the bullring, reveal how the cows can be as dangerous as the bull running beforehand..